Naugra Lab Auto Karl Fischer Titrimeter. Auto Karl Fischer Titrimeter is an automatic apparatus designed to carry out Karl Fischer Titrations for accurate determination of moisture content in various samples. The instrument comprises of two units i.e Contol Unit & Titration Unit. The Control Unit controls the complete automatic titration. On pressing the START button, the titration starts and the KF reagent is added automatically from the burette, through a solenoid valve into the titration vessel. As soon as the end point is reached, the titration is stopped automatically by the Control Unit. It has fully solid state circuitry incorporating advanced IC technology. 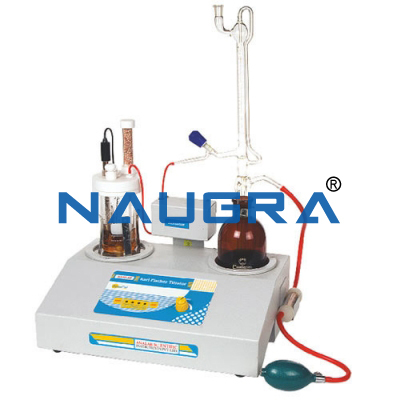 Titration unit contains the magnetic stirring mechanism and the solenoid valve assembly. The cabinet is designed to serve as a titration stand. Karl Fischer method for determination of moisture content is used in pharmaceutical and drug manufacturing industries, food stuff, sugar, wood, paper and textile industries, petroleum refineries, chemical and fertilizer units etc. 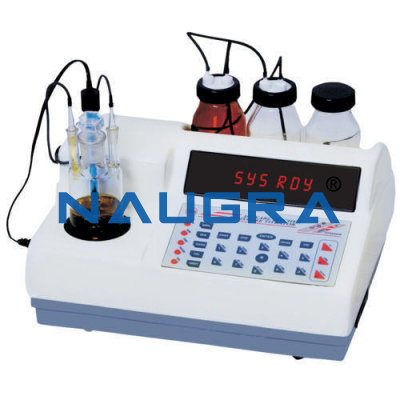 Other Related Teaching Lab Products, Scientific Instruments and Educational Equipments like Naugra Lab Auto Karl Fischer Titrimeter. . .